The Pinterest execs (does Pinterest even have executives?) seem to have a secret mandate to make sure everything in the whole world is covered in lace by the middle of 2012 (Lace plates, lace phones, lace hi-tops, lace nails). Maybe they make commission on every spool of lace sold at national craft chains or perhaps its just an unnatural appreciation for the vintage look, but trust me, there is something there. I’m okay with it. This scarf uses lace from a thrifted table cloth ($5) and an XL men’s t-shirt ($3). The thrift store we visited had probably 25 of this style of tablecloth and runner – no shortage of lace to repurpose into lacy sweet scarves. 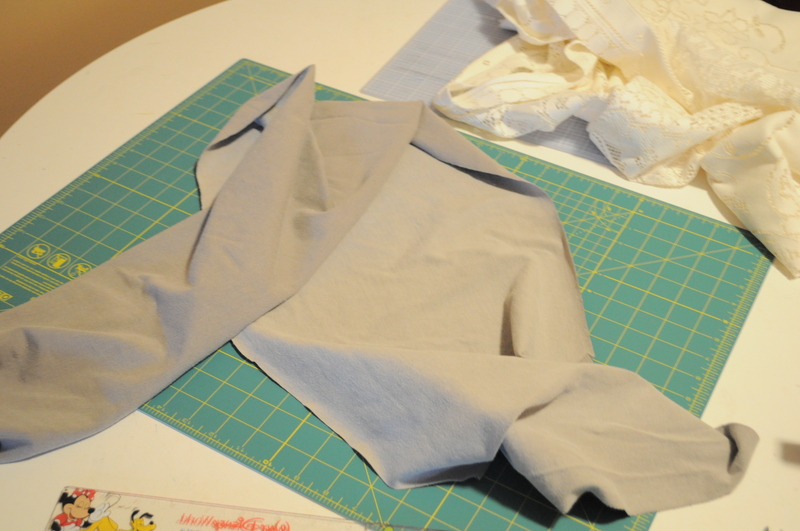 To start, cut the bottom hem off the shirt, and cut a 14″ strip from the body of the shirt. 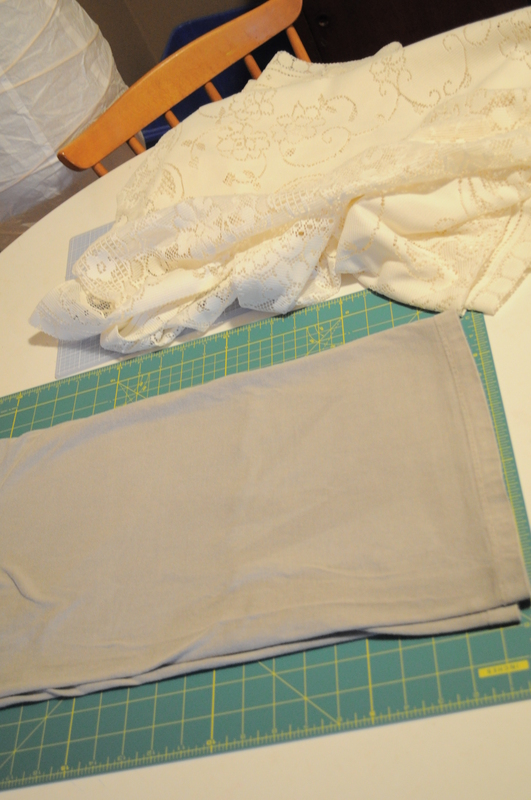 Cut through it to make a 14″x50″ (length is approximate, depending on the size of your shirt) rectangle and set it aside. Cut sections of lace 14″x20″ and trim the tops and bottoms according to the pattern of the lace to add some visual interest. Don’t worry about symmetry. Pin the lace to the end of the scarf, overlapping by at least 3″. Using thread that matches the lace and thread on the bobbin that matches the scarf, sew across the bottom 14″ edge of the scarf, straight across the lace (to secure it in place). Sew up the sides to the top of the lace and follow the pattern of the edge of the lace to the other side, sewing back down to the edge of the scarf. Repeat on the other side. The best part? 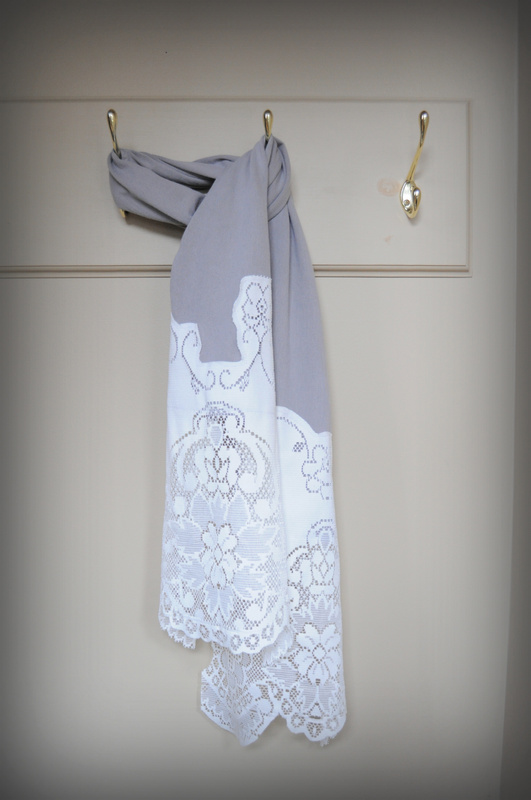 There is more than enough lace in a tablecloth for a few scarves to make for all sorts of people who can rock a little lace. 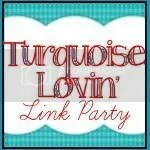 Check out Lunch Hour Crafts on Etsy!